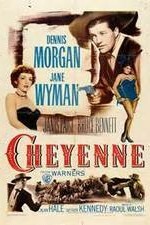 Buy or Rent Cheyenne (1947) Movie DVD & BluRay Online! Movie Plot: Wells Fargo stages are being robbed by ‘The Poet’ and no one can find out who he is. Wylie is a gambler who is found by the sheriff and gives him the option of going back to a questionable trial in Carson City or finding ‘The Poet’ for the stage line. Wylie decides to look for the outlaw and he rides out in the stage with Ann and Emily to Cheyenne. He soon finds that the Sundance gang is waiting for ‘The Poet’ so he impersonates him and finds that Ann is the wife of the outlaw. Wylie is concerned about the gang, ‘The Poet’ and Ann.